A few tips on how to teach your children to play by themselves. “A child loves his play, not because it’s easy, but because it’s hard.” Benjamin Spock, M.D. One of the best gifts you can give your child is the ability to play on their own. Not only will day to day life with them be easier (both for your children and yourself), but they will learn so much more! Problem-solving and decision-making skills are stalled when there’s always someone to think for them. Imagination and creativity aren’t relied on when games are always made up by someone else! By now you probably know why it’s important that children play on their own every day, but if you’re like the many mothers who’ve commented or emailed me, you don’t know where to start. If your kids aren’t used to playing on their own then there will be some adjustment and resistance, but take heart. My kids have had independent play times for as long as they can remember and – most days – they love them. Read the pros of independent play here. 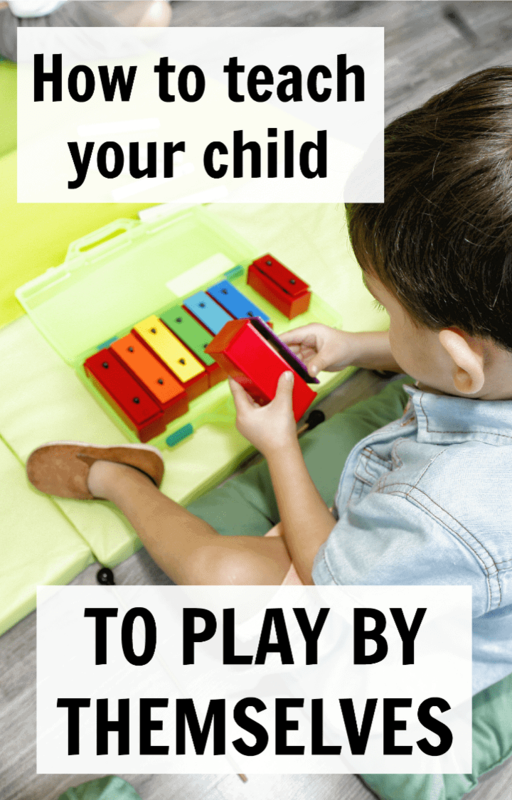 So, here’s how you can help your kids learn and enjoy playing on their own. It may take a while for your child to stop fussing or crying when it’s time for them to play on their own, so be sure you know the why’s. Not only is it good for kids to have time alone away from their siblings and others to relax, play time alone also builds self-confidence. They use their imagination, learn cause and effect, and have to problem solve on their own. Plus, it helps prevent raising children who are easily bored and need others to make decisions for them. That really isn’t so bad when they are small, but as they grow older it can turn into a bad thing. I’ve started mine doing independent play from before they could play ;). Infant seats, pack-n-plays, and cribs are great places for babies and pre-toddlers to learn to play with their toys. However, no matter how old your child is, it’s a great time to start! If they are not used to having to play on their own you’ll want to go slow. 5 minutes might be all they can handle, and even that they might fuss the entire time. Put them wherever you’ve decided play time should be (see #3) and assure them you’ll return. Close the door or pull it to, and then wait outside. If they crying then let them know you are right there and try again. Expect some resistance at first because no one likes change. However, if they get past the initial hurdle they will usually launch right into play. The location is not important as long as there’s something for the child to do and some type of boundary in place. It’s not really independent play if they roam around the house and you have to follow them to be sure they aren’t getting into trouble. I usually put my kids in their own rooms (none of them currently share) to play. They enjoy this and have their own toys ready for them. However, if it’s a nice day or one would like to play outside then that’s fine too! Rotating the setting can help children cooperate willingly if they aren’t used to playing on their own initially. Always be within supervision distance, of course, but stay out of sight. They won’t do anything but stare at you and whine if they can see you. Our children have independent play in the morning, and one way I get them to willingly go to their rooms is by offering a snack. I’ll choose a non-messy snack that is in no way a choking hazard, and will take them to their rooms. They’ll bring their cup or little bag of gummies and water and pop right into their rooms to play. It’s part of our daily routine so there is usually little resistance because – well – resistance is futile. Mwahaha! If you are beginning independent play it might be a good idea to get a few new toys so that there is something special to begin this process. Some days when fussiness has dominated the morning and I fear that they’ll fight going to independent play (it isn’t often, but it definitely happens) I’ll let the kids switch rooms. It’s a different setting, different toys, and new things to do so that almost always gets them excited. Also, you can separate your toys into separate areas of the house, and save some toys they are only able to play with during alone play time. This will help keep it fresh and exciting. 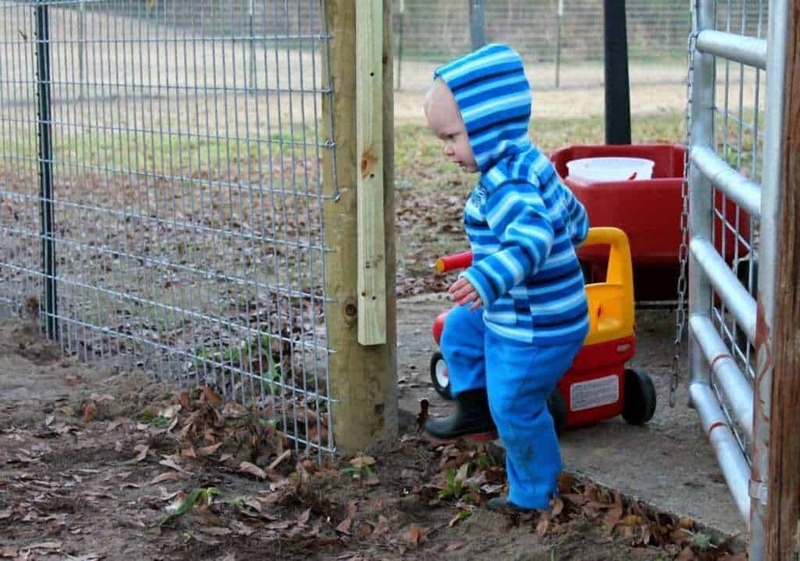 Independent play time is something that works best with consistency. Sure you don’t have to do it every day, but I really believe both you and the kids will love doing it every day once you get in the swing of it. Choose a time that works best and try to have play time during that time each day so the kids know what to expect. Knowing what to expect is a huge thing for children, and they are much more likely to participate without a fight if they see it coming. Start with 5 minutes, 10 minutes, and then work up to 30 minutes or an hour as the child is able to do so and enjoys it. Mine play around 45 minutes to an hour each day. I will walk from room to room and hear one making truck noises, one talking to her dolls, the other singing a song or talking to some stuffed animals. Totally. I love it. So many times I will observe my daughter playing something I cannot fathom where she got the idea or what she’s actually doing… and I know that if I would have been playing WITH her, we would not have been doing that particular thing but rather something that makes sense to ME. I love seeing her imagination and creativity. One thing that has made a huge difference to us once she hit about 2.5 years of age was using a kitchen timer so that she knew it would ring and she could be done. She loves her independent playtime and my second (9 mos) loves it as well. We don’t have good playrooms so we just have IP in the living room… my oldest sits on a blanket and my baby in her playpen. Both of them talking, singing, and playing sweetly… So precious! One of those little things that makes being a mommy SO much easier and more fun. When IP is done, we’re all ready to be together again! Great idea about the timer, Elisabeth!!!!! And isn’t it so much fun to observe them? Ha. I love it too. We do room time each morning for an hour with my 3 year old and I love it so much! It’s really the only time that he sits down and actually plays with his toys. I know that he is being creative and (normally) having a blast because I can hear all of the car noises and songs over the monitor. I try not to go in and help him if it’s something that he can figure out on his own. Sometimes I feel guilty for sending him to his room, but then I remind myself that he NEEDS to learn to play alone and it helps him is so many ways. Exactly, Missy! I feel guilty sometimes to and then go stick my ear to their door and hear them happily playing, not even looking or waiting to come out! It’s so beneficial in so many ways and I honestly believe (though I have no proof) that it is why they are well behaved in public or at appointments, etc. Because they are used to entertaining themselves without me so if I’m distracted it isn’t the end of the world! I love your perspective! I have been doing something similar with my kids were little. It is sooo helpful to be able to send them to play and know I’ll have some time to get something done, usually without interruption. I just wrote an article on the same topic and I’ll add your link to it. Thanks for the encouragement to keep going at this! My son is 16 months old. How do you that with your 18 month old? Do you leave him alone in his room for independent playtime? Or do you place him in his crib? I’d like to try indepent playtime but I cant practice it on a daily basis because we work and our son go’s to daycare. Any tips? Hi! I really, really love this concept, but I have a question: does it count as independent play if it’s in your general vicinity? I can get my daughter to play on her own for quite some time, but if I put her in her room and shut the door it’s extremely difficult. She’s perfectly happy in the living room while I’m at the computer, etc. though. But is that not truly “independent”? Should I push her to spend time in her room as well? Lydia, I think that’s fine. If she does that for a while perhaps you could transition her to her room if you thin it’d be good for her but as long as she’s playing on her own then good! Hi, thanks for all your great tips and time dedicated to this blog. I want to begin encouraging my 4.5 yr old boy to play more independently cuz as it is right now it rarely works unless spontaneously from his own will, he gets into a zone and enjoys his own play for 5 minutes to 20 minutes. but if i try to encourage him he complains. so my question is when introducing independent time as a structure and routine as you suggest, would it be helpful or not to explain to him why he must play on his own (for example, mommy needs time for ____ , or it is good for you because ______ ) and what if he can’t come up with something he wants to play with and asks me for help, and doesn’t like any of my suggestions either? Hi if i sit beside her without disturb her own play while i doing other activities such as reading book. it is consider play alone? Helen, I think the defintion is whatever you want it to be. If she plays well near you that’s great! She doesn’t have to be off somewhere else if it doesn’t work for you. Love this idea! I definitely believe the same thing but I think it would help us to put more structure around it. I have 2 boys ages 2 and 3 and I’d love to implement this. What would you suggest if they decide they need something during this time? I can see my 3 yo calling for me for help, or to show me something or whatever until he gets used to the idea. When you first start, do you ignore them, tell them you’re purposefully not coming in, etc? Hannah that’s tricky of course because maybe they need “help” but I usually just respond with something like “Tell me when I come to get you in a bit.” because otherwise you give an inch they take a mile and it is NOT independent play. I care for a 5 month old, since 6 weeks she is carried on her mother’s hip never out of her sight moved from room to room with her never alone except during night sleep or naps. When she comes to my quiet home, its just me and her, and lots of time. However, she laughs one minute, cries the next, very seldom plays in crib, or activity rolling chair, on floor by herself. Always watching what I’m doing or where I am. If I move slightly in a chair she starts crying sometimes screaming. I try to encourage her to sit in the play and pac and play with toys, enjoy musical toys, lay there alone 5 minutes after she wakes up to stretch and look around play with toes before changing her diaper. If I step away from her a second to get a bottle she is screaming and carrying on… I spoke to father yesterday and asked if they couldn’t encourage some time alone for her to relax and become a little more self confident and explore her surroundings alone…Is this Impossible!!! The last child I cared for was 6 weeks to almost 5 years old never had that problem with her other others I’ve cared for……. Oh man, sounds like it starts at home and baby is probably really screaming for attention. I guess if you give that attention during the day in play and comfort and nurture, perhaps THEN she’d do some independent play? Hi there. I have a two year old son who goes to daycare. He will play independently there but when at home cries for videos all day long – and I mean all day. I know the video addiction is my own doing but I don’t know how to redirect his attention when at home alone with the newborn – he is relentless! Do you have any toy suggestions for a 2 year old boy that may have him excited to play in his room? How do you keep them in a location? My daughter is 2 1/2 and can climb and open everything. Would I have to install some kind of lock in her door. I’m concerned she will view her bedroom as a negative place if I lock her in. That would be bad considering she has always been an awful sleeper and I don’t want her to fight going into her room at bedtime. Hi, how can we schedule independent play if our 3 year old does not have his own room? He also does not have many toys. How can w start? He’s never had any independent play, how would that affect him? Hi, I love this post. My kids can play together without me okay sometimes. I have a 5 year old that really needs to learn to play independently in his room. I will be starting this. But I have a question about how you do this with room sharing. I have twin two-year-olds (next month) and they share a room. We are in a small apartment without a yard and I don’t keep many toys in the living room. So how do you do this with children sharing a room? I can’t put them in their cribs. They would not enjoy that. And we will be transitioning to beds within a year anyway. We’re new to the concept of IP. My little girl is 19 months and we’re starting out slow. Today was day 2 and she cried almost the entire time (about 10 minutes) I provided snacks, new toys and reassurance that I’d be back. She has some separation anxiety as it is and I just want to make sure I’m doing this right and not causing her more anxiety. Any other tips? Hi, our 18 month old goes to daycare 3 days a week, is with grandparents 1 day a week, with me one day a week and my husband and I on weekends. She doesn’t play independently very well and definitely relies on me/us to be involved/entertain her. No doubt this is our own doing but is really like to promote independent play. Just wondering how successful this will be given the varying circumstances during the day and how she’d go if I just worked on getting her to play independently on the 3 days she is with me? Also, if I put her in her playroom and closed the door I’m sure she’d end up beside herself. What do I do in this situation or do I encrouage her independent play in our living room? (I worry the living room would result in her coming over to me to want to be picked up and crying).